Before you get to the part where fermented juice turns into wine, prior to picking the grapes, much of the work need to produce great wine takes place in the vineyard. Many of the choices made by the vineyard manager dictate the type of wine, style and character of the finished product. The goal for most top wines is achieve the desired level of ripeness in the grapes, with considerations given to the amount of yields hoped for, from the vineyards. All these choices take place long before the grapes are picked. During the winter months, following the previous vintage, green pruning and bud thinning take place. The purpose behind this is to decrease the amount of plant material on the vines that could hold back the grapes from thefull value of being exposed to the sun. This will also help encourage concentration in the fruit. How much green harvesting takes place in the next step. Green harvesting will determine much about the type of wine being produced. A green harvest is essential to reducing yields. While green harvesting is conducted in most Bordeaux vineyards, it’s a moderately new practice that began to take hold in 1986 in the Medoc, before moving to the Right Bank by 1989. Green harvesting is simply the act of removing unripe grape bunches. This is done while the grapes are still green, hence the term, green harvesting. By conducting a green harvest, the remaining berries will receive more important nutrients. In turn, this should increase the concentration and flavor compounds needed to make great wine. Decisions also need to be made regarding the amount of buds per vine. A second green harvest can take place later in the growing season, removing clusters that are not ripening well, further concentration the best grapes on the vine. Deleafing or leaf removal is another choice made in the vineyards. The removal of leaves to allow for more exposure to sun, while cutting down the opportunity for the development of rot is sometimes needed, depending on the vineyard, growing seasons and desires of the wine maker. Depending on the vintage, and the appellation, a harvest can start as early as mid September, or as late as October. The fruit is picked at the top estates by hand and with machines at other wineries. Harvesting begins with young vines as they mature first. Grapes for white wines, Sauvignon Blanc and Semillon are picked before fruit used to make red wines. Merlot is picked before Cabernet Sauvignon and Cabernet Franc. The grapes are vinified separately. 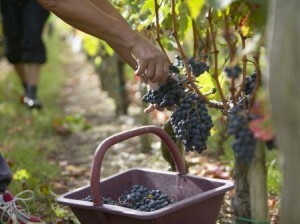 Some of the largest Bordeaux chateaux require over 200 pickers to help with their harvest. Selection of the top fruit usually takes place at least twice in the vineyards and at the winery. This is usually done by hand. However, starting with 2009 in Bordeaux, Optical Sorting Machines have been used at select Chateaux. Taking the vintage into consideration, the decision on when to pick is crucial as it determines the style and character of the wine. The date of the harvest allows the winemaker to produce a wine in the character and style they prefer. When the grapes are picked also determines the level of alcohol, sugar and acidity in the wine. Some growers prefer picking slightly before, or even before the grapes are fully mature. This gives them brighter flavored, less potentially alcoholic, and more acidic fruits to vinify. Picking earlier, does not always produce grapes with ripe seeds, skins or tannins, which will be reflected in the wine. Waiting to harvest when the berries are fully phenonically ripe can be dangerous as the grapes cold be exposed to rain during that period. Phenolically ripe fruit is sweeter, potentially higher in alcohol and can deliver darker, fruit flavors and even notes of blueberries along with plusher textures. Growers that wait too long can harvest grapes that are over ripe, higher in sugar and alcohol and taste similar to raisins and figs, which is not desirable. St. Emilion is currently leading the way for technological advancement. 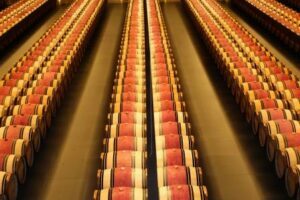 To aid in harvesting, Gerard Perse, who owns a myriad of Bordeaux properties, most notably Chateau Pavie, helped develop the optical sorting machine over a 4 year period. This is a big help for chateaux who want to produce and make red wine. The machine uses image analysis allowing unwanted elements to be removed. Thus, operators can set the machine to remove foreign objects, vegetal or unripe berries by size or color. The fruit moves along a conveyor belt with a blue background while a camera takes continuous pictures, analyzing the grapes. An ejection mechanism removes unwanted objects using high frequency, pneumatic nozzles. The optical sorting machine is a welcome advance to many growers. But not every wine maker agrees. For example, Chateau Margaux prefers conducting most of their sorting in the vineyards. 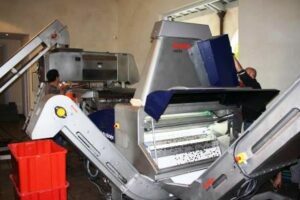 The argument against that practice is, with manual sorting, which takes longer than the optical sorting machine, growers run the risk of developing rot in the vineyards while waiting for full phenolic ripeness. That might not be the sole risk. Manual destemming might have additional side effects which releases enzymes contained in the rot that could potentially lead to unclean fermentations and a potential loss of color. To combat this enzyme infection, mechanical destemmers, along with optical sorters, have been created to help with the process. The devices work in tandem. Because of the newness of the machines, their expense, and their limited availability, they are being used primarily in Pomerol and St. Emilion. But they are also being tested in the Medoc at Mouton and Leoville Las Cases. This has proven to be a strong asset for estates that produce and make red wine, as well as white wine. It’s said that the next technical innovation could be the use of ultrasound, which might have the ability to sort fruit by color, size, and sugar content. These advances in harvesting, along with continued better understanding of the vineyards and of individual terroirs, are part of the reason for the continuing progress in wine making today. The majority of top Bordeaux remove the stems completely. This allows for less rustic impressions or vegetal aromas. Machines remove many of the stems, but manually destemming is gaining popularity. It is practiced in a myriad of properties like Pape Clement, La Violette and Angelus. For the 2009 harvest, Angelus added a line of 60 people to manually destem berry by berry. According to Angelus owner, Hubert Bouard, manual destemming helps berries remain intact, retard oxygenation and retain freshness. 2009 is the first vintage being hand destemmed at Angelus. This labor intensive technique made its debut in Bordeaux during the 1997 vintage when Michel Gracia introduced it at his eponymous property. The technique was simultaneously deployed in the Languedoc by Jeffrey Davies at Chateau de la Negly and Clos des Truffiers. After the fruit is destemmed, the grapes are crushed. The resulting juice/skin mixture (called “must”) is either pumped or moved by gravity flow into wood and/or stainless steel fermentation vats or tanks. However, things are changing at some estates today in Bordeaux. In fact, it is slowly becoming more common for vintners to ferment, using whole clusters. Whole cluster fermentation means that the grapes are vinified with their stems attached. The chateaux using this technique vary the amount of fruit that is whole cluster fermented, from 10% to as much as 45%! The reason behind this is, the stems can help lower potential temperatures during the fermentation process, which can also lead to lower alcohol levels. The addition of stems can add more tannins and acidity, giving the wine, more a fresh, vibrant character. At certain estates, another benefit is the natural increase in their press wine. This takes place because the stems make it more difficult to extract the juice, leaving more potential press wine in the berries. Interestingly, another benefit from whole cluster fermentation comes from later harvesting, as growers will need to leave the grapes on the vine for a longer period time, to allow the stems to fully ripe. After sorting the winemaker decides on the how he wants to ferment his grapes, starting with, are the grapes first crushed, or are the skins just slightly broken, or is the fruit whole berry fermented? Today, many growers are whole berry fermenting, thus reducing the risk of oxidation. Prior to fermentation, many producers cold soak, and or cold macerate their grapes. This process adds color and depth of flavor while keeping out the potential bitter taste of the tannins in the wine. The reason this process needs to be at a lower temperature is to not allow the wine to begin its fermentation process, which needs higher temperatures to occur. Fermentation is what turns fruit juice into wine by allowing the yeasts metabolize which then converts sugar into alcohol. Temperature controlled stainless steel vats are the most common vessel used for fermentation. Some Chateau also use wood and several also prefer cement tanks. 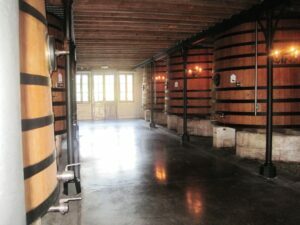 In a few smaller properties, usually located in St. Emilion, they are able to employ open top wood fermenters. Open top fermenting is utilized more often in Burgundy. At this point, wild or cultivated yeasts begin turning the grape sugars into alcohol. A few producers even ferment entirely in barrel. This process is called micro-vinification. 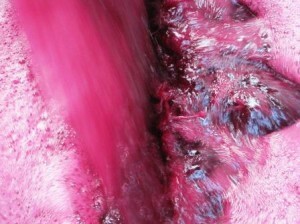 Most of the estates using micro-vinification are located in the Right Bank, because of the intensive labor needed for this process. It is just too much labor for a large estate to do it. The benefits to in barrel vinification are most often in the addition of silky textures. There are two schools of thought to utilzing fermentation in barrels. Using 100% new, French oak barrels in either case, one method is to emulate an open top, oak fermenter, meaning that the top, or head of the barrel is removed. The barrel is then filled with the grape must. The grapes can be macerated, after which the yeast is added to start the fermentation process. To keep the cap moist, the winemaker conducts, gentle, manual, punch downs. Other producers prefer to again, fill barrel with the grapes and must. Instead of leaving the top open they seal the barrel. To keep the cap moist, the barrels are rotated twice a day. The spinning of the barrels allows the wine maker to gain more extraction as well. any of the estates using this method have the Oxoline system in place, which makes it easier to manually turn the barrels. For examples on chateaux using either method, at La Fleur de Bouard, they use the open top method. At Le Gay and La Violette in Pomerol, they prefer the closed barrel method. There are produces like the Pomerol estates we mentioned that vinify 100% of their wine in small barrels. While other estates only vinify a small portion of their harvest in barrel. As this technique continues to gain more adherents, vintners in Napa have also started to vinify portions of their wine in barrel. 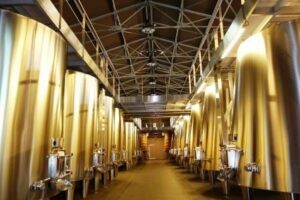 Depending on the Chateau and the vintage, machines can be used to concentrate the must through a process known as reverse osmosis or vacuum evaporation. Both techniques remove excess water. While some people claim this harms the wines ability to age, that has not proven to be true. Properties like Leoville Las Cases have employed those techniques since 1987. At 20 years of age, their 1990 still shows young as have many other wineries practicing that technique. The next decision needed is the fermentation temperature. 25 degrees Celsius to 30 degrees Celsius is average. The level of temperature helps to promote a style of wine. Wineries seeking more body might ferment at lower temperatures, while producers looking for lighter bodied wines will ferment at the top of the range. It’s important not exceed 35 degrees Celsius. If that happens, the yeast could die causing the wine to stop fermenting. Fermentation is usually complete in 8-10 days. During fermentation, cap forms consisting of solid matter like seeds, skins and stems. It is important the cap remains moist. This is done by either manually punching down the cap, or pumping over. Some wine makers chose to do a pre fermentation, cold soak, or cold maceration. During this process the must, is chilled to 10 C and allowed to soak for up to 10 days. This allows further extraction of the fruit giving the wine deeper color and more complex aromas. Maceration is contact of juice with skins for color extraction. This takes place after fermentation has concluded, meaning all the grape sugars have been converted into alcohol. Most Chateaux allow between one and two weeks for the maceration. At this point, the wine is separated from the lees (solid matter) and the skins are pressed producing press wine. Some of this can be blended into the wine to give it more body. During this process estates introduce oxygen into the wine and continue to keep the cap moist. Carbon dioxide, a byproduct of the fermentation process is created as the sugar converts to alcohol. The carbon dioxide gas continues rising to the top of the tank while pushing the skins and other raw materials to the top of the vat well. This creates the cap. The cap needs to remain moist and submerged. The two most common methods to accomplish this are pump overs or punch downs. Pumping over adds air and keeps the cap moist by removing the juice and pumping it back over the cap. Punching down are most often done by hand, meaning that someone needs to push the cap down, back into the vat, keeoping the cap wet. Another modern method is the pneumatage process which pushes compressed air or gas into the wine. The air or gas recirculates the juice and keeps the cap wet. This important, secondary fermentation turns tart malic acids into more lush lactic acids. This process takes between 2 and 3 months and in some vintages, even longer. Malolactic fermentation can take place in barrel or vat. The winemaker makes his choice depending on the style he wants to produce. Malolactic fermentation in barrel results in more opulent wines. However, being labor intensive, Malolactic fermentation in barrel usually takes place at smaller estates. Today, a new technique has evolved in Bordeaux known as co-innoculation. Co-innoculation means that the alcoholic fermentation and malolactic fermentation takes place at the same time. This usually takes place in January or February after the MLF has finished. However, there is no hard or fast rule. Some properties wait until closer to bottling before blending. Others, put the wine back in barrel for a few months before blending. The blending consists of which blocks will be used and the percentage of each grape varietal. It is at this stage that most properties determine what wines will go into the Grand Vin and what will be relegated to the second wine. The next important choice needing to be made is the type of vessel used for aging the wine. In most cases, oak barrels are used. The amount of new barrels versus old barrels, the level of toast the barrels receive and the type of oak must be considered. The top estates in the best years will often use 100% new oak barrels. During this process known as elevage, the wine adds a variety of smells to the wine ranging from vanilla, toast or coffee. The wine is racked (moved from one container to another without moving the sediment) while in barrel. This typically means four to six times before fining and bottling. Some producers today are using cement, egg shaped vats to age a portion of the wine in, hoping to add more minerality to the wine, and less oak characteristics. Today, while aging wine in French oak barrels is the still the number one choice of all vintners, there are estates that are now aging part of the wine cement, egg shaped vats. This is done to help add minerality characteristics to the wine. Other estates have started aging a portion of their wine in clay, amphora jars. This is the final clarification of the wine before bottling. This is done with egg whites or powdered albumen (the protein of egg whites). Usually the egg whites are beaten in a bowl with a little salt or salt water and added directly to the barrel. A steel rod with a flat end is used to mix the egg whites with the wine. A final racking, after about 45 days, is performed to remove the egg white sediment that has settled to the bottom of the barrel leaving a clear wine. The final step in the wine making process is the bottling. Once the shape and size of the bottle is determined, the bottles are disinfected, the wine is placed in the bottle and a layer of gas is put on the top of the wine, which acts as a preservative. Wines are bottled on average about two years after the harvest. Although some chateaux and wineries bottle later, allowing the wine more time in the barrel. Bottles are filled and corked but not labeled at this time because different countries require different labeling practices. With all that in mind, what’s new in Bordeaux wine making today? A lot! Today in Bordeaux, more green harvesting takes place. Yields are lower. Fruit is being picked at higher levels of ripeness, richness and increased concentration. This brings cleaner, more pure flavors, along with higher levels of alcohol, sugar and raw materials to the wine. When possible the majority of the top Bordeaux producers are searching for full phenolic ripeness. Phenolic ripeness takes place when the tannins, along with the skins, seeds and stems, as well as the fruit are all fully ripe. With riper levels of fruit, not only is the wine sweeter as was mentioned previously, the wine can take on a lusher, more opulent texture. Many of the changes in farming, wine making and vineyard management have helped this new, exciting trend in Bordeaux winemaking. While some tasters remain stuck in the past and believe the changes taking place are the result of more intervention, nothing can be further from the truth. The reality is, today, the search for cleaner, more pure fruit, with less invasive wine making techniques is the goal. The trend to producer, fresher, richer, more complex Bordeaux wine that display a greater sense of purity of fruit, with riper, softer tannins and more intensity of flavor is taking place at all the top estates today. The first changes take place in the vineyards. Moderately recent changes in Bordeaux vineyard management techniques start during the growing season with modern vineyard management techniques. Many estates continue moving in the direction of sustainable, farming practices and eschew the use of chemicals in the soils. Low yields are desired and to this end, the best estates continue severe selection in the vineyards, green harvesting and crop thinning. They also focus their attention on shoot positioning, leaf pulling, canopy management and other techniques designed to harvest fruit that has achieved full phenolic ripeness when possible. During harvesting, today, the majority of estates now conduct harvesting by hand and place the fruit in small plastic crates with perforations in the baskets to allow juice to naturally fall from the crate to avoid including oxidized juice in the wine. Sorting, sorting and more sorting is the name of game for Bordeaux wine makers today. Initial sorting’s still take place in the vineyard, but additional sorting’s in the reception center, using optical sorting technologies are in use all over Bordeaux today. This intensive sorting helps ensure only the grapes with the desired level of ripeness are allowed to be vinified. More attention continues being focused on destemming. A new generation of destemmers and vibrating sorting tables are in use to make sure no unwanted materials are vinified. The next step in the chain is the gentle movement of the berries on conveyor belts, instead of forced through pumping’s. Many of the top chateau move everything in the cellars by gravity, which leads to softer textures. Several wine makers are now going one step further and fermenting whole berry fruits to further retain freshness. Whole berry fermentation can help reduce, unwanted, rustic tannins. Longer periods of maceration, to add more color and flavor to Bordeaux wine is another tool in the wine makers arsenal today along with cold, pre fermentation. More Bordeaux producers are in favor of cap punching instead of pumping over, as it’s gentler on the wine. While it was once considered advanced to move wine by gravity in wine making process, today, numerous Bordeaux wine makers only move everything in the cellars by gravity. This gentle movement is considered to add more softness to the wine. For vinification, the best estates with the funds now have enough vats that vary in size to allow for parcel by parcel vinification, which allows for much more precision as each plot can be vinified to its own specific needs. Depending on the size of the size of the estate, the choice between performing malolactic fermentation in tank, versus vat or barrel might not be possible. But for estates that have the room, manpower and funds, it’s quite common to perform malolactic fermentation in barrel. This technique is used more often in the Right Bank, with its Merlot dominated blends. This technique once again brings additional softness to the wine, especially when the wine is young. the grapes to be attacked by Botrytis, which is officially known as Botrytis Cinerea or noble rot, the wine maker decides how to press the grapes. The grapes at the top estates pressed in whole bunches using a vertical press, which is the most gentle and slowest method available to extract the juice, as well as the most expensive. Or they can use for example pneumatic presses. Fermentation at the top estates usually takes place entirely in barrel. Chateaux can also vinify in stainless steel, or cement tanks. The fermentation process is slow. It can take several months before it’s completed because of the high sugar levels. The choice of Chapatalization needs to be made if the fruit does not have the desired degree of sugar to convert to alcohol. However, that is almost never done at the best chateaux. The best properties age their wine using a healthy percentage of new, French oak barrels. The percentage of new oak barrels and the amount of time the wine is aged in barrel varies from chateaux to chateaux. Chateau d’Yquem uses 100% new French oak barrels, while many of the other great producers use closer to 50% new, French oak barrels for the aging of the wine. While Chateau d’Yquem can age their wine in up to 36 months in barrel, most produces do not age their wine as long. On average, the wine spends 22 months or less in barrel. The level of alcohol is important in Sauternes. If the potential level of alcohol appears too high, winemakers can stop the fermentation process by either lowering the temperature of the wine, or by adding sulphur dioxide. Labor intensive techniques are in vogue at smaller Bordeaux estates. Some chateau age the wine on its post malo lees, with little racking, hoping to add more color. At some estates, the practice of moving or gently rocking the barrels without opening them, which could further oxidize the wine is being used today. Today, chateaux are including more of their wine in their second wines, not only from the vineyards, but based on a barrel selection as well. When the estate is large enough, and can afford to take risks, especially at the level of the First Growths, it is not uncommon to see third and even fourth wines today. While this amount of selection seriously reduced the amount of the Grand Vin, the quality and price ratchets up, for consumers seeking best wine money can buy, as only the best juice is reserved for the top wines. The amount of new French Oak barrels used to age Bordeaux wine seems to be decreasing at some estates today, as many producers are hoping to slightly reduce the effects of new oak. The trend continues for estates to bottle their wine without filtering or fining, which allows more of the raw materials to remain in the wine. Consumers today are also fortunate that some of the most expensive wineries have instituted anti counterfeit measures with special bottles, labels and tags. To further aid the end user, greater care is now taken in the supply side of the chain as more attention is now paid to maintain temperature control, keeping the wines cool and in the best possible condition.